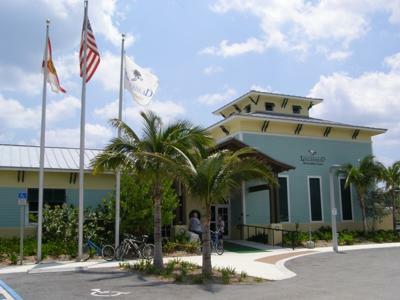 Loggerhead Marinelife Center is located in Juno Beach, FL. Loggerhead Marinelife Center is a non-profit organization nestled along Florida's east coast in picturesque Juno Beach, Florida offering free admission to over 200,000 visitors annually. The center's mission is to promote conservation of Florida's coastal ecosystems with a special focus on threatened and endangered sea turtles. The campus sits adjacent to one of the most densely nested beaches in the world for loggerhead sea turtles. The green, leatherback, and loggerhead sea turtles that nest on Juno Beach, as well as the hawksbill and Kemp's ridley turtles that swim off the coast, form the impetus for the center's focuses on research, rehabilitation and education. The center's current campus features an on-site state-of-the-art sea turtle hospital, several aquariums buzzing with marine life, experiential learning exhibits, a learning center, and an outdoor Turtle Yard. A stop through Loggerhead Marinelife Center's gift shop allows visitors to support the organization through their purchases of marine-themed books, apparel, children's toys and games, home décor, and jewelry, all available at a variety of price points. The current campus, built in 2007, is designated by the Florida Green Building Coalition as a Certified Florida Green Commercial Building. But the organization's roots trace back to the exemplary vision of a conservationist decades ahead of her time. Juno Beach resident Eleanor Fletcher was curious as to why so many hatchlings headed toward land instead of out to sea. Fletcher's intrigue led her to perform some of the earliest research on sea turtles in Florida. She inspired the support of local children and began teaching ocean conservation lessons above her husband's real estate office. She believed children were the most influential stewards of the ocean, and education was the foundation for shaping their environmental behaviors. In 1985, The Children's Museum of Juno Beach opened. In just 1,600 square feet of space, the museum hosted 10,000 school children a year, setting the stage for what would one day become Loggerhead Marinelife Center. Today, over 20,000 school children visit the center each year. Loggerhead Marinelife Center's rehabilitation program works in tandem with the center's goals to educate. Loggerhead Marinelife Center treats more than 50 sea turtles and thousands of hatchlings each year. The center's groundbreaking rehabilitation work has been covered by leading national and worldwide media outlets including AOL News, CNN, USA Today, the Associated Press, MSNBC, BBC World Service, UK Daily Mail, and many more. The on-site Gordon & Patricia Gray Veterinary Hospital features a large observation window where guests can witness the hospital staff performing its inventive work. The center also employs a team of biologists that study Juno Beach and the sea turtles that nest there. During nesting season, biologists work overnight to observe nesting leatherback sea turtles and collect data that allows humans to better understand these ancient creatures. In 2011, the team documented 28,179 sea turtle crawls; 1,926 green sea turtle nests; 8,193 loggerhead nests; and 190 leatherback nests on the beach adjacent to Loggerhead Marinelife Center. In addition to studying the local beach, the research team satellite tags some of the center's patients each year so they can obtain information about how these threatened and endangered animals behave in the open ocean. More information about Loggerhead Marinelife Center may be obtained by calling 561.627.8280, emailing info AT marinelife.org, visiting www.marinelife.org. The center is located at 14200 US Highway One in Juno Beach, Florida. Loggerhead Marinelife Center is a must visit place while we travel to Florida. We can see that thousands of people visit this Center every year and that shows the quality of the service that is provided here.